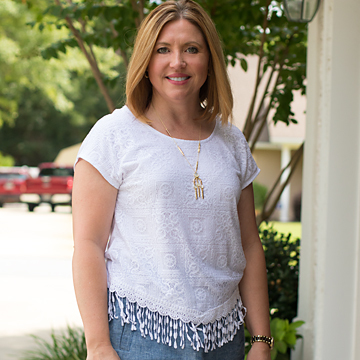 I love an easy, comfortable summer outfit. Let’s be real, who wants to fuss with clothing in the heat? The last time I wore this top, I paired it with wide leg pants. This time I paired it with this chambray pull on skirt (red version here). This is such a comfy skirt. I should have worn it more this summer. Maybe I could pair it with a plaid shirt and booties for fall. What do you think? This necklace was in my Rocksbox. Try out the service for a month free with code FONDABFF.